Today’s post falls into the category of Research Road, however, the information I discovered didn’t make it into my novel, The Secrets of Dr. John Welles, or more correctly, it was removed. The reason for this underscores my admonition to always check your facts. Whether you’re writing historical fiction or fantasy with factual details familiar to the known world, it’s important to present the particulars accurately. In an effort to entice potential readers once my novel is published, I have familiarized them with characters and situations through the food I featured in the story. Recipes for these meals can be found in Edible Fiction. Last week, I wrote a post for an apple pie eaten in a scene relaying Dr. Welles’s first trip into the town where he decided to spend his later years. For this particular pie, I chose to use Paula Red apples. They are among my favorite pie apples because they have an old fashioned flavor and become sauce-like when baked. I thought a little history on the heirloom apple would make for an interesting blog post, and that’s when I learned my mistake. According to several websites devoted to antique apples, Paula Reds were discovered as a seedling in Sparta, Michigan in 1960 by Lewis Arrends. The apple, named for Arrends’s wife Pauline, was a happy accident that appears to have descended from the humble McIntosh. Why is this important you ask? Because the scene in which a Paula Red apple pie is eaten by Dr. Welles took place in 1958, two years before their discovery and ten years before they hit the market. Perhaps my favorite apple wasn’t as vintage as I first believed. I know readers are expected to suspend some belief at times and trust their favorite writers, yet I can’t allow that one person who could nail me on the facts to be disappointed any more than I could tell blatant lies. Obsessed with the facts? I think so! 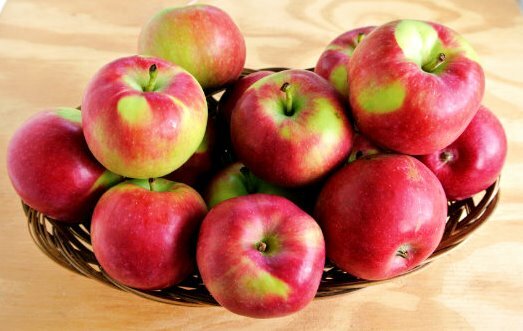 In closing, I hope that another writer will benefit from the information presented about Paula Red apples. At the very least, I hope I’ve prompted writers to check their facts. By the way, if you want a great recipe for an apple pie, check out the post All-American Goodbye. I still insist, a detail as small and insignificant as a Paula Red apple 🍎 as opposed to a Granny Smith or any other type of apple would never be caught, discovered, researched or what ever by a reader wanting to enjoy a well written novel. Heck , half the people don’t even know what a Paula red is. The other half don’t know how to bake a pie let alone research an apple’s origin. LOL – love you, Mom!